"You've broken the Golden Rule like 20 times already this morning!," screamed Lucy at her brother this morning. Upon hearing this, I didn't hear the screech in her scream or the utter annoyance with her brother. No, I heard that she knows the Golden Rule. Okay, okay, she wasn't using the rule, but she knows it. And I think somewhere I get bonus points for that, right? I'm not usually a half-full kind of person. But sometimes on this wild ride of parenthood, I am forced to look at the silver lining to make me feel like a semi-successful mother. 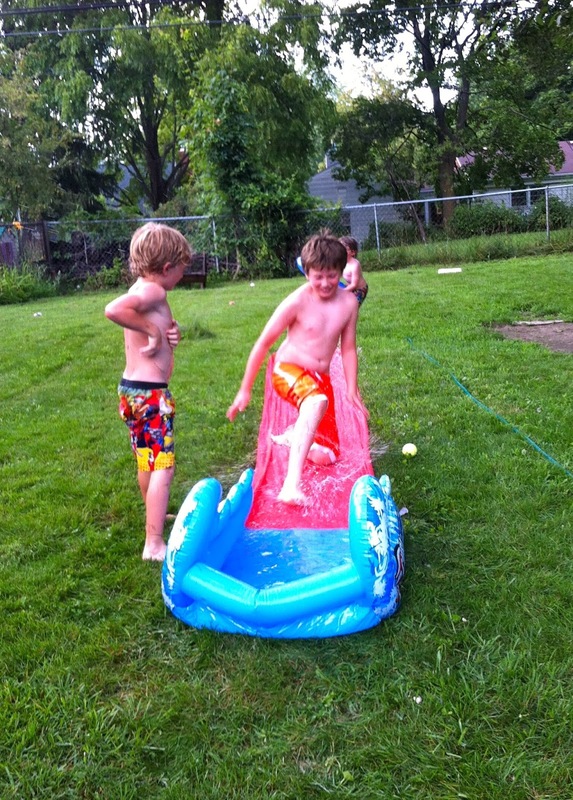 In other I-might-just-be-somewhat-of-a-decent-mom news, I bought a $20 Slip n' Slide for the kids and they loved it. Sure it destroyed large sections of our backyard and the slide was ripped and ruined after three days of use, but they had a blast. And they played nicely with each other for hours. See that? Another half-full/silver lining moment. Watch out folks, I'm on a roll. This past weekend was a busy, summer weekend full of sliver linings and good times. 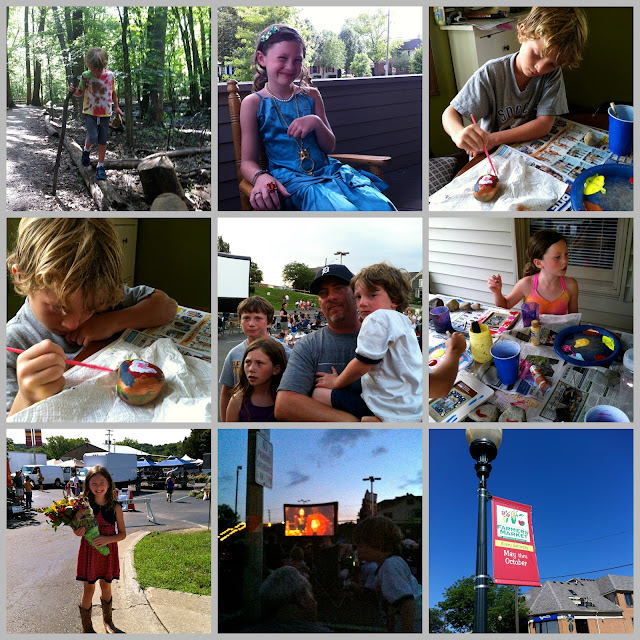 And painting rocks, playing dress up, a farmers' market, baseball, an outdoor movie (BRAVE) and more. How was your weekend? What were your silver linings? Have any half-full parenting moments? 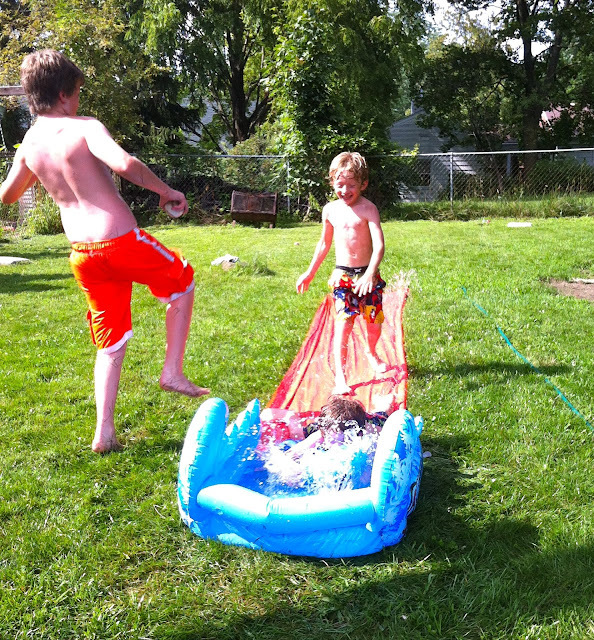 Yesterday I spread a large tarp in the front yard, filled a wading pool with water, and gave the kids the water hose. They lasted 15 minutes. I have no idea what's wrong with my kids. That would have been the height of entertainment for me when I was growing up. Slip n' slides are AWESOME. I'm glad you had a good time this week!